Today, in India, we face both an environment as well as a development crisis.On the one hand we are still struggling with the problems of inequality,poverty and improving the human development indicators. On the otherhand, environmental pollution and ecological destruction is now a runawayproblem. Both these crises are also interacting with and reinforcing each other. This isbest reflected in our energy sector. India suffers from chronic energy poverty. Officially, about 300 million people haveno access to electricity. But if we consider the fact that about three-fourths of ruralhouseholds connected to the grid have erratic and less than six hours of electricitysupply, then about 700 million people in the country can be termed electricity-poor.Similarly, about 700 million Indians use biomass such as dung, agricultural wasteand firewood as the primary energy resource for cooking. These fuels cause indoorpollution and increase the risk of diseases among women, who predominantly workin the kitchens in India. The estimated economic burden of using traditional fuels,including health costs and lost economic opportunities due to poor education of thegirl child, is estimated to be ₹30,000 crore. 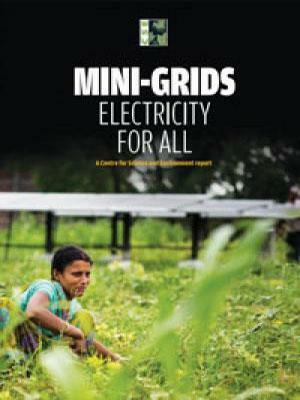 About two-thirds of Indians, therefore, isstill deprived of modern energy services. India is largely dependent on coal to meet its energy needs. Coal meets more than 50per cent of the current commercial energy needs and generates more than 70 per centof our electricity. We are the third largest producer of coal in the world, after Chinaand USA. But the energy from coal comes at huge environmental and health costs.It is estimated that of the entire industrial sector, 60 per cent of particulate matter(PM) emissions, 45–50 per cent of SO2 emissions, 30 per cent of NOx emissions and morethan 80 per cent of mercury emissions come from coal-based power plants. Coal-basedpower plants also account for about 70 per cent of the total freshwater withdrawal bythe industrial sector and close to half of our total greenhouse gas emissions. On top ofthis, most of the coal mining areas have been declared as critically polluted areas. Infact, there exists a fatal overlap of coal reserves, dense forests, tribal populations, highpoverty and backwardness. Mining coal, therefore, leads to huge conflicts betweenthe state and mining companies on the one hand and the local communities on theother hand. It also leads to destruction of dense forests and wildlife which may beextremely difficult or impossible to regenerate.